Discover Western Australia's oldest wine region on this full-day tour of the Swan Valley from Perth, including lunch. 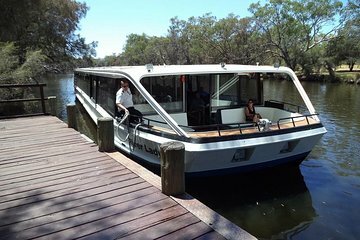 Indulge in a decadent morning tea, followed by wine and cheese tasting, as you cruise down the Swan River and admire views of the Perth skyline. Then, set out on a coach tour of the Swan valley vineyards, stopping to enjoy wine tasting, tour a brewery and indulge your sweet tooth with a visit to the Margaret River Chocolate Company. End the day with a complimentary Perth, Burswood or Guildford hotel drop-off. excellent cruise and winery visits, plenty to see and drink, well worth the journey and experience. We loved every minute of it especially the boat .such great staff all of tour.would DEFINATELY recommend.we meet some lovely people as well. We had a great wine tour of the Swan River Valley in Perth! The Captain Cook Cruise and wine tasting was very well done in addition we had tastings at three wineries after disembarking the boat as well as a visit to The Mash for a beer tasting and the chocolate store for a yummy truffle tasting. We were staying in Fremantle to leave the next day for a cruise and the train station was within walking distance from our hotel and the Quay where the tour disembarked. Great tour! The river cruise was fantastic. The view and the weather was incredible together with wine tasting. After lunch, we went to 2 winery for wine testing, 1 brewery and 1 chocolate factory. The experience was fabulous. The only thing I didn't expect was the cruise was one way while the returning back to Perth was via the bus. First let me say the bus driver and boat crew and anybody else involved in the tour were very help full and friendly. The tour itself was very good but not quite what was expected or not as advertised. The Adds say a decadent morning tea I'm not sure that a chocolate muffin qualifies as decadent but it was nice. The coach tour wasn't exactly a coach, it was a slightly weathered mini bus. The tour of the brewery wasn't a tour either it was just drinks and food in a very rowdy bar to the point we felt the need to leave due to an altercation involving a drunken group from another company. I know this sounds very negative but the day was very enjoyable and I recommend it as a good day out. I just think the advertising on the website is a bit over ambitious for what is the reality. Well organized - great staff. Great time had by all! Very beautiful tour and very well organized.